The Rebel Sweetheart. 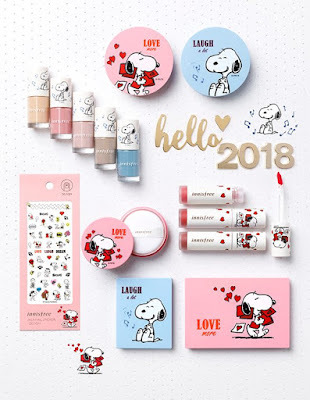 : Sneak Peek | Innisfree x Snoopy Collection. Korean cosmetics brand Innisfree has just launched a new, canine-inspired collection - it's the Year of the Dog, after all - and good grief, it's as cute as can be! A collaboration with the American comic strip Peanuts, this new collection features Snoopy, the adorable and good-natured beagle that we all know and love. The collection goes by the theme 'Love, Laugh, Dream Big in 2018' - a simple reminder for everyone to dream big, chase your dreams, and enjoy life while you're at it. Included in this collection are two new cushion cases, which you can fill with the cushion of your choice. I'm a sucker for cushions with cute packaging, and Innisfree, whose current selection has more than fifty designs to choose from, is about to lure me again with these Snoopy cushion cases. Innisfree x Snoopy Cushion Case, 8000 won. 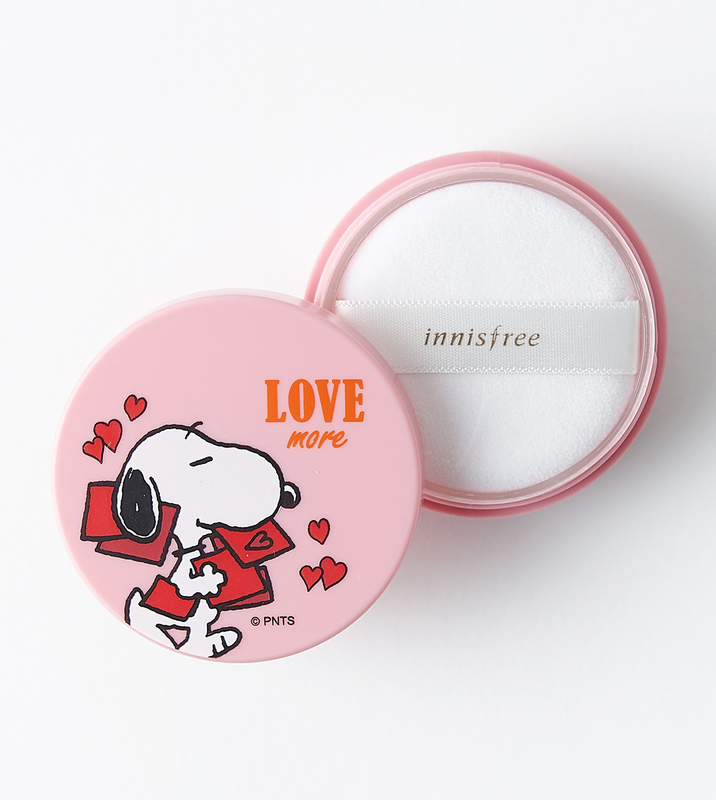 The No Sebum Mineral Powder, one of Innisfree's best-selling products, also has Snoopy printed on its packaging. This product is known and loved for its versatility, as it can be used a primer, setting powder, and even as a dry shampoo. Innisfree x Snoopy No Sebum Mineral Powder, 6000 won. Another customizable product is the My Palette Case, which comes in small and medium sizes. These cases are sleek, handy, and interchangeable, and can house your favorite eyeshadows and blushers. Perfect for traveling! Innisfree x Snoopy My Palette Case, 6000 won (small) and 9000 won (medium). 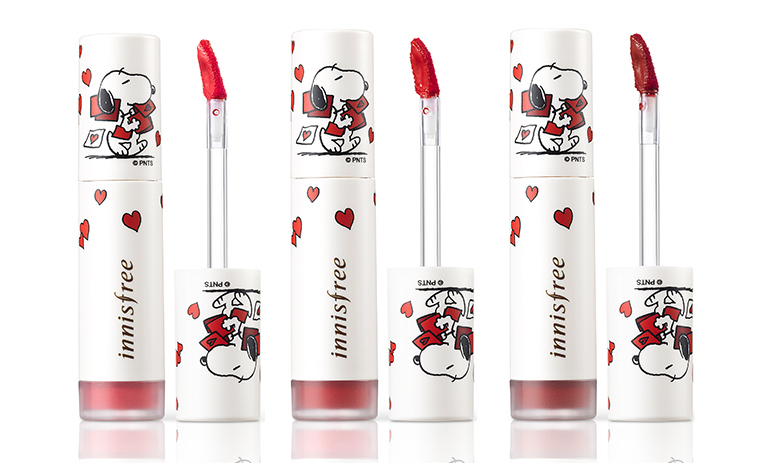 Speaking of makeup, the Innisfree x Snoopy Collection also includes three new shades of the Vivid Creamy Tint. Formulated with botanical ingredients, these tints give your lips a nice tinge of color that lasts for hours. 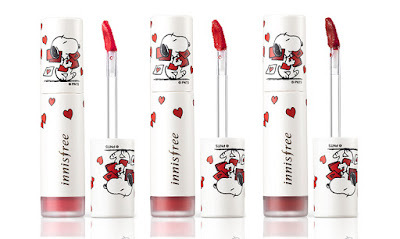 Innisfree x Snoopy Vivid Creamy Tint, 10000 won. If you love pastel colors (and I know most girls do), you'll be thrilled with these new additions in the Real Color Nail line. These lovely, cheery colors are guaranteed to brighten any girl's day! Innisfree x Snoopy Real Color Nail, 3000 won each. Of course, no K-beauty collection would be complete without hand creams! With scents inspired by the scenery of Jeju Island, these Jeju Life Perfumed Hand Creams make your hands soft, smooth, and smelling good! Innisfree x Snoopy Jeju Life Perfumed Hand Cream, 4000 won each. Finally, we have the the Limited Edition Orchid Box, which bears semblance to last year's Lucky Orchid Box. 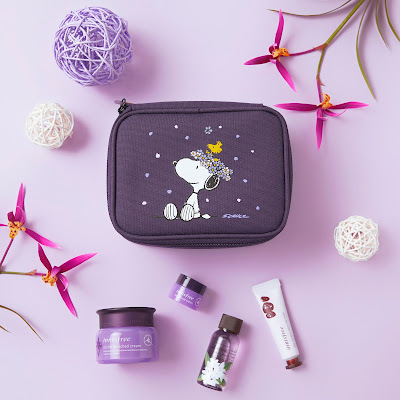 This particular skincare set includes an Orchid Enriched Cream, a miniature Orchid Eye Cream, a My Daphne Body Cleanser, and a Jeju Volcanic Color Clay Mask housed in a travel-sized bag featuring Snoopy. Innisfree x Snoopy Limited Edition Purple Box, 29000 won. The Innisfree x Snoopy Collection is now available at Innisfree stores across South Korea, and can also be purchased online via Innisfreeworld. Looks like these products are nice. Korean products are indeed awesome and i heard a lot of great feedback of their skin care products and cosmetics. I love Snoopy. The liquid lip looks really great. I love the colors variety. These products are so adorable! I would love to try the Limited Edition Orchid Box and the No Sebum Mineral Powder.